Zengobi's Blog: Curio 7! Wow! We are so pleased with the success of Curio 7! This is one of the most successful product upgrades we've ever launched and the feedback from everyone has been wonderful. Thank you! These descriptions don't explain the flexibility and features Curio offers. Basically, if you have text, web pages, designs, photos, movies, audio recordings or any other type of information in your Macintosh, Curio can help you manage and keep track of that information in just about any way you can think of. Yes, there are several programs out there which will organize your notes or remind you of an appointment. I've seen most of them and they all pale in comparison to Curio. While I have your attention, I thought I'd mention another big feature in this release: super-charged tags. Sure we've had regular tags for years. And we've had flags for years. Tags were just words; flags were just images. In Curio 7 we've combined them and made them even better. 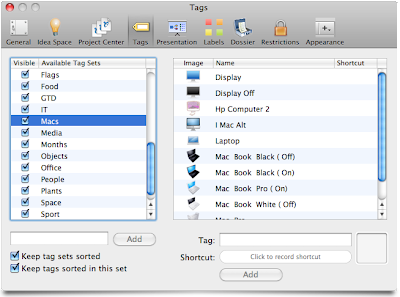 In Curio 7, go into the Tags panel within Curio's Preferences. It lists all global tag sets and all tags within each set. So of course you'll find all your tags there and, well howdy-do, you'll find all your bundled and custom flags imported into there as well. Each tag can now have not only a phrase associated with it but also an optional image. You can even specify a keyboard shortcut key if you'd like. This means toggling a tag association is incredibly fast: just select a figure and hit the keyboard shortcut. Creating custom image tags is super easy thanks to the dozens of icon repositories on the web. Check out the hundreds of PNGs and ICNS on IconArchive, or visit one of the many sites listed on this Smashing Buzz collection, or even the 16x16 transparent PNGs from FamFamFam's Silk collection. Download the icons to your Desktop then drag-and-drop them into Curio to add life to your tags. More Curio 7 news coming soon!